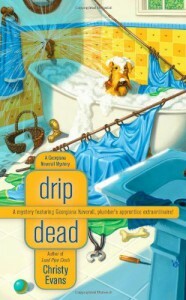 Drip Dead is the third and final book in the Georgiana Neverall plumbing cozy series. It was an enjoyable read and I'm sad to see the end of the series. While I did't know how I would enjoy a series focused around a plumber, that aspect of the book is not emphasized too much. If anything it lends plausibility to her involvement in murders, such as in this story, finding a body under a house while checking the pipes. Besides plumbers tips at the start of every few chapters, there really isn't any plumbing talk. This book can likely be read as a stand alone without reading the rest of the series. The background you may need to know is that Georgiana is a former internet security specialist who left/was forced out of her company. She moved back to her hometown in Oregon and is in training to be a plumber. Since moving back to town she has started seeing her high school flame, Wade. Georgiana and her mother have a somewhat strained relationship that they are working on. In this book Georgiana finds the body of her mother's fiancé and has to solve the murder to clear her mother's name. We don't really have other suspects until at least half-way through the book, but a few suspects do crop up and it's fairly easy to keep all of the characters straight. Georgiana's life and safety are put on the line a few times as she works to find the killer, but this is a heroine in her 30's and she doesn't come across as taking excessively stupid or over the top risks. Overall, this is a fun, light read and I would recommend it. If you have the time, I would start with the first in the series, Sink Trap, but it's not necessary.